Aloha Hawaii Crew, AZ Chandler here. Wanted to post this on your club site and say Mahalo for whatever you may be able to help with. It's our best site and we're needing to raise some funds for the PG launch we're breaking ground on this weekend. You should come over and fly with us for our Labor Day Mingus Fly-in PG launch celebration! And I was thinking if you guys help us now I'm sure we'll be able to help you in the future make a new or fix up one or more of those awesome launches you guys got over there :-)! Thanks again gang and I'll see you all when I'm back on Oahu for most of September. See article below for motivating facts. 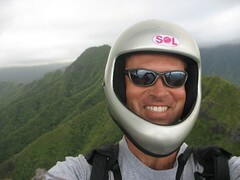 The Arizona Hang Gliding Association needs your help. Mingus Mountain has been a historic and epic hang gliding site since the beginning of hang gliding and after years of persistence we have finally obtained permission from the Forest Service and powers that be to make it biwingual!!!!! This is a HUGE undertaking to say the least and we need all the help we can get not only in manpower but financial aid as well. MINGUS MOUNTAIN: 7800 ASL YEAR ROUND BIG AIR THERMAL XC MOUNTAIN SITE WITH XC ROUTES FROM THE NW TO EAST AND MORE DEPENDING ON WINDS ALOFT WITH NO SPECIAL FLYING RESTRICTIONS. To give you an idea of how incredible a flying site this is and what’s possible I will start by saying that HANG GLIDERS HAVE FLOWN TO GALLUP NEW MEXICO FROM HERE! This is Arizona’s prime cross country flying site, with no PG launch!! Located in the cool Pine trees 10 min directly above the historic mining town of Jerome Arizona, there is enough room to set up 30 hang gliders and paragliders by launch, an incredible amount of free camping at our USHPA members-only campgrounds, an actual bathroom, and is one of those places you fly that is breathtaking to say the least. Along with the fact that the historic town of Jerome, Once a thriving mining camp between the late-1880s and early 1950’s, is now a bustling artistic community with a population of about 450 and includes a modicum of artists, craft people, musicians, writers, hermits, bed and breakfast owners, museum caretakers, gift shop proprietors, is an enchanting town, a photographer's paradise, and well you know, an awesome place for the friends and family that don’t fly to go for the day after watching us launch. Mingus Mountain is simply an awesome place to fly, and hopefully soon to be an awesome place for paragliders to fly, if we can raise the funds. So please help us with however much you can. Thanks and in the mean time Fly Far and Land Soft. Chandler, that sounds like a great project. I just donated $20 on your club's paypal button. I hope you get plenty of helpers - wish I could make it but I'm stuck on the east coast for a few more weeks. Let us know how it goes. Sounds great. I hope I get a chance to fly there someday. I have matched that $20 donation. C'mon, you can do better than $20! let's help'em out! We're totally in a hole with around 10k over budget. Once the liquid dynamite didn't work and we started damaging heavy equipment trying to bust rock things started going over budget quick. But hey, we launched it today!!! Now I gotta get some dough something quick like. Thanks again and check out our club site for the Labor Day Fly-in and sweeeet raffle!!! !